With sales of newly-built homes soaring and average homes prices rising, it’s no wonder builder confidence is at a 5-year high. Unfortunately for today’s home buyers, however, the market shift portends fewer “great deals” into 2013. According to the U.S. Census Bureau, 389,000 newly-built homes sold in September 2012 on a seasonally-adjusted, annualized basis — a 27 percent jump from one year ago and the highest reading since the $8,000 federal home buyer tax credit-fueled month of April 2010. Meanwhile, as demand for new homes rise, builders are holding supplies down. As compared to last year, September’s available housing stock of 145,000 homes represents a 9 percent reduction. At the same time, builders report than prospective buyer foot traffic is at its highest levels since early-2006. The combination is pushing new home prices higher. The average new home now sells for $292,400 — a 14.5% increase from one year ago. Median home sale prices have made similar gains. 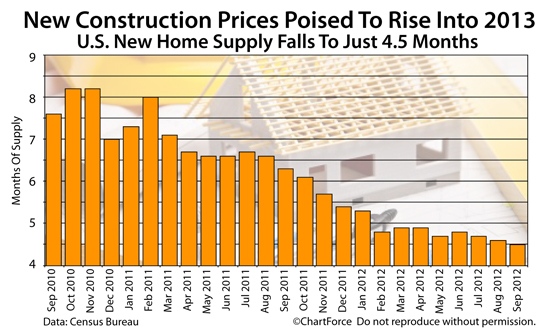 The new construction is moving off its October 2011 bottom and builders are applying lessons learned during last decade’s downturn. Most notably, builders have not over-built into the recovery. Supply has remained controlled and steady price gains reflect it. At September’s sales pace, the entire stock of new homes for sale nationwide would be sold out in just 4.5 months. Readings of less than 6.0 months suggest a “seller’s market” and, by way of comparison, in January 2009, with the economy in the doldrums and mortgage financing scarce, new home supply peaked at 12.1 months. Furthermore, in “high-cost” areas such as Loudoun County, Virginia; Montgomery County, Maryland; and San Jose, California, the FHA and VA will allow for loan sizes larger than the $625,500 conforming loan limits set for those areas. The FHA grants a maximum loan size of $729,750. The VA allows for mortgages up to $838,750.